Given the amount of fur dog owners find on their clothes, carpets, and home, many owners wonder if their dog is going through the normal shedding experience or whether it's excessive dog shedding. And that's a good question because your dog’s coat can tell you a lot about their health. Most of the problems your dog might be experiencing will reflect on the way they look, so a dog’s fur is really a mirror that shows their overall physical state. However, shedding can sometimes be completely harmless, while in other situations, it can be an indicator of a serious problem. A dog owner needs to know how to tell the difference. 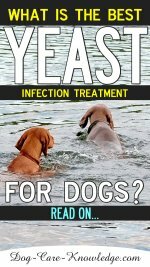 So, let's talk about excessive dog shedding, how to observe the behavior of your dog and prevent possible problems. Shedding is quite normal for all dogs. 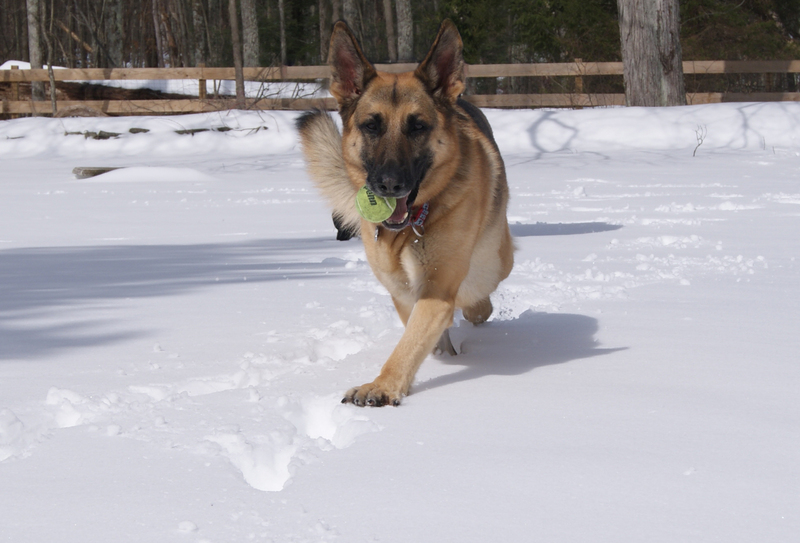 First of all, there’s a significant difference between indoor and outdoor dogs; dogs who spend most or all of their time outside have a greater response to the climate. So, you’ll be able to notice an increase of shedding with the change of seasons – because they are in need of a warmer winter coat, your outdoor dog will shed heavily in springtime. Indoor dogs who spend time outside when it’s their walk time also experience this change, but it’s a lot less obvious so their shedding habits won’t be as visible. Therefore, if you have an outdoor dog that starts shedding after the cold season is over, you shouldn’t panic, because that’s completely normal. However, if you keep your dog indoors and they manifest changes in their coat that they shouldn’t, you should look for a reason behind it. Another reason that you may think your dog is excessively shedding, is if they are 'blowing their coat'. Dogs that originate from colder climates e.g. German Shepherds, Siberian Huskies, Bernese Mountain Dog, etc., have a double-coat which works effectively in keeping them warm. Underneath the long coarse hairs of the top coat, is a soft yet warm undercoat. Often when the season changes, double-coated dogs experience a change in their coat to suit the season. When this happens both the top coat and dense undercoat shed together, resulting in fur coming out in large clumps which, if you don't know what to expect, may look like your dog is excessively shedding his coat. It's completely normal for double-coated dogs to blow their coats two or even three times a year. Dogs That Don't Shed.....Or Do They? I'm sure you've heard of the hypoallergenic dogs that don't shed (Poodle, Bichon Frise, Maltese, etc.,) but that's a bit of a misconception really. All dogs shed, these breeds just shed less and have tight curly fur. When a dog with this type of dense, curly, coat sheds, instead of falling on the floor, or sticking to our clothes, the loose fur tends to wind itself around the surrounding hair which often results in matting. This is why these breeds usually require constant grooming, brushing, and often clipping to prevent matted fur. So, don't be alarmed if you see your 'non-shedding' breed, actually shed its fur. Whatever the cause of extensive shedding is, you’ll be able to recognize it in the early stages, visit your vet, and solve that problem before it develops. Alternatively, you can ask a veterinarian on JustAnswer. Here you’ll be able to speak online to a licensed veterinarian within minutes (24/7, 365 days) and talk 1-on-1 from the comfort of your own home. All licensed veterinarians are confirmed by a third-party verification firm that uses an 8-step process that checks license and credential verification. The only way to truly know that your dog has a problem is by taking proper care of them all the time and develop a basic dog care routine, you can find more on this here. Maintaining a healthy grooming and hygiene routine will go a long way to ensuring your dog's coat and skin stays in optimal condition. In this case, regular brushing and combing play an important role, so even though it's a pain, we shouldn’t skip on this chore. Luckily, there is a fantastic de-shedding shampoo and conditioner, that helps enormously with this issue. 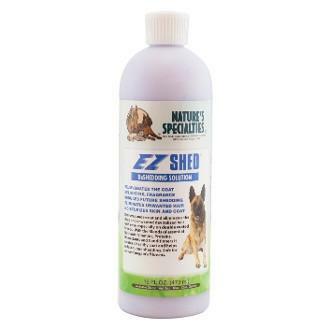 EZ Out Shampoo and EZ Shed conditioner have been formulated to remove dead hair and gets deep into the undercoat. By using this combination you’ll be able to easily work out the undercoat with less mess and eliminate the dead and devitalized hair. EZ Out shampoo and EZ Shed condition use a unique blend of essential nutrients, vitamin, proteins, and humectants that are critical in revitalizing a dead, dull coat, that will reduce excessive dog shedding and creates a healthy coat. Once your dog is bathed follow up with brushing and combing. I like the Oster Undercoat Grooming rake followed by a slicker brush for the top coat. Furthermore, you should know that a proper diet filled with all the necessary nutrients is the best way to prevent all future health problems for your dog. Ensure your dog is being fed the best dog food your budget can afford and one that includes a good source of healthy essential fatty acids (EFA). Lack of Omega-3 and Omega-6 EFAs in your dog's diet is a common reason for skin and coat problems in dogs. If in doubt, supplementing your dog's food with fish oil is the easiest way to get the necessary nutrients from their diet. A good source of Omega-3 and Omega-6 is Salmon Oil. I recommend Pawsome Naturals Wild Alaskan Salmon Oil. It has a pure source of essential fatty acids that are sustainable sourced from the pure, clean waters of Alaska. FDA certified as conforming to the Good Manufacturing Practices (GMP) . 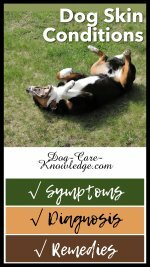 And finally, your dog’s mental health is as important as hygiene and nutrition are. When dogs are exposed to potentially stressful situations, like moving to a new home, for example, they can experience excessive shedding of their coat. Therefore, you should monitor your dog’s behavior when you expose them to changes. Once again, the professional opinion of your vet is what counts here, so don’t postpone the visits if you notice a potential problem. 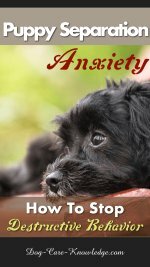 You can also find more help on dealing with anxiety in dogs here. Just remember when you're covered in dog fur, it's quite likely to be normal. 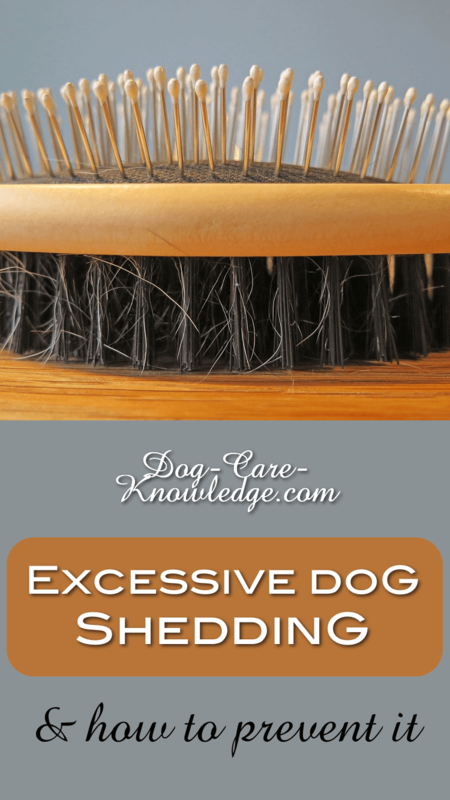 Even if your dog is shedding excessively, it may be due to how much time he spends outside, climate change, a stressful situation, or simply that he's blowing his coat. Bathing in specific de-shedding shampoo and conditioner will go a long way to keeping on top of the heavy shedding period, as will ensuring your dog has a plentiful supply of essential fatty acids (Omega-3s and Omega-6s) in his diet. 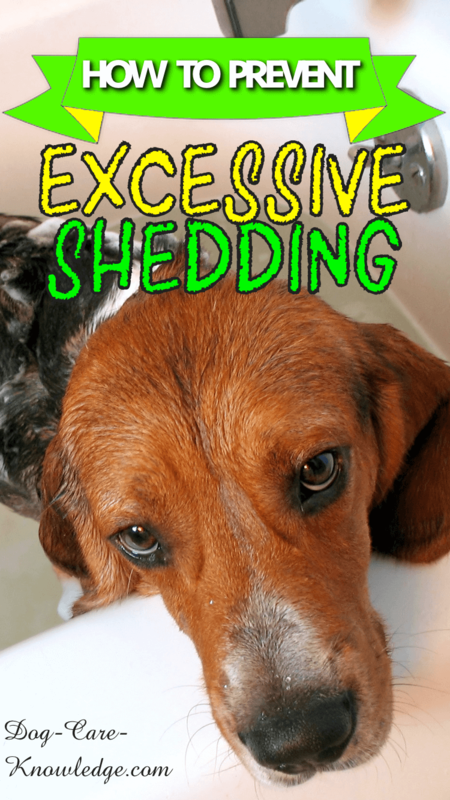 Be aware of the potential signs to look for (as above) that would require a trip to your vet and don't be alarmed if you see your non-shedding dog....shed!